So if you’re getting ready for your family vacation that includes a top snorkeling destination that’s known for an abundance of marine life, you can bet that it’s something your kids will remember for years to come! And, part of getting your kids ready for snorkeling is to get ready for a fun and SAFE snorkeling experience! This includes safety from using the snorkeling gear, and it includes safety from the sun! Here’s what to wear snorkeling for adults! And be sure to check the best hotels in Waikiki for family-friendly activities! Even if you’ve already booked your hotel, you can get in on the action at the lagoon! So, what snorkel gear is best to pack for kids? For the safest snorkeling experience on vacation, you’ll want to give your kids a chance to practice before you head out to the ocean. This could be in the bathtub at home, the pool at your local YMCA or high school open swim hours, a lake or river at your local park, or even at the hotel pool once you’re on vacation. If time doesn’t allow (and even if it does, really! ), give the first go when you’re on vacation at kid-friendly snorkeling beaches with calm water. How do you know if it’s a kid-friendly snorkeling beach? 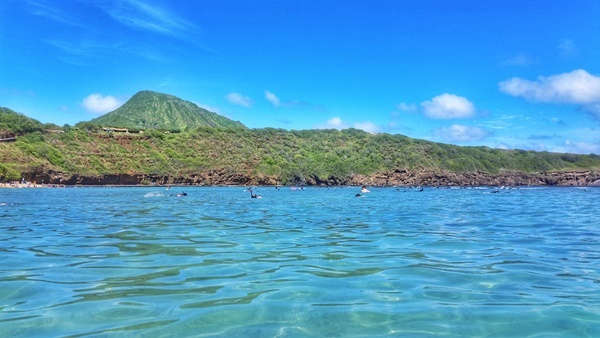 Although waves can come across even at the most beginner-friendly beaches, it can be good to seek out the top snorkeling spots with enclosed lagoons or a bay that is better protected from ocean waves. Having a good fitting snorkel mask is one of the top things that can make it so your kids will be able to use the mask and snorkel properly. That’s why for younger kids it is best to go for a designated kids snorkel set or youth snorkel set. Have a look at this one that’s a standard kids snorkel set. There are also full-face snorkel masks for kids like this one. With full-face masks, it can make the breathing process a little bit easier and is generally seen as being beginner-friendly. Should you rent snorkeling gear for kids? Even if you know there’s snorkel rental available at your destination, or you’re going on a snorkeling tour where gear is provided, you may want to bring along your own kids snorkel set anyway. This gives your kids a chance to practice and become comfortable with underwater breathing through a snorkel before vacation. If your kids aren’t confident swimmers, now could be a time to hone those valuable life skills (swimming!) by having them take some lessons at your local high school or YMCA. It’s possible to buy a standard snorkeling set that comes with fins like this one, or a full-face mask that comes with fins like this one. But you can also find kids snorkel sets without fins. So should you get the snorkel set with the fins? What fins can do is they will allow a snorkeler to swim further more easily. This means that with fins, kids will spend less energy than without fins, so they likely won’t get tired as quickly. In general, snorkel vests are designed to allow snorkelers to swim with their head in the water, as opposed to a traditional life jacket that’s designed to keep your head above water. Snorkel vests shouldn’t be seen as a complete safeguard, but it does add an extra layer of security if your child is not a confident swimmer, and you can have a look at a snorkel vest for kids like this one. Another option for an added security measure is to have a personal buoy at arm’s length. Similar to a snorkel vest, it can be used as a safety precaution. Your kids would wear this buoy with a strap that goes around their waist, and the buoy will be floating along behind them as they swim. This type of buoy is best to be able to spot your kids in an instant if you’re not swimming side-by-side. If they need a quick break, they can use it to rest on too, but it is primarily used to be spotted easily. Take a look at this buoy to see how it’s used. Your kids can go snorkeling in the swimsuit they already have. But if they are only going to wear their regular swimsuit, make sure that they are lathered up in some water-resistant sunscreen for kids like one of these bottles! For even more sun protection, these types of swim clothes can be perfect for a day out on the water when kids are snorkeling! Not only do they provide more coverage leaving less skin exposed, but the clothes have UV protection, often up to UPF 50, which means the harmful UV rays will be less likely to pass through the swimwear too. Most dedicated swim shirts will be designed with the UV protection. Many dedicated swim shorts will also use UV protection material, but shorts are less likely to have it, so be sure to check for that if that’s high priority. For swim tops, have a look here. And for swim shorts, have a look here. But, you will want to lather up that sunscreen even if your kids wear swim clothes with UV protection, because you don’t want to neglect the skin that’s still exposed! Getting a cheap underwater camera for snorkeling like this one will not only allow your kids to capture the memories that will last a lifetime, but if you think that they might be fearful in the water, it can serve as a distraction! They will love taking pictures of all the colorful fish swimming around them so much that they might just forget that they were scared! And for you, mom or dad, have a look at what to wear snorkeling too! 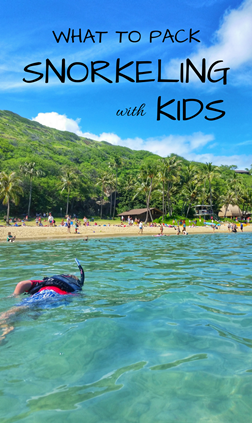 HAPPY SNORKELING WITH YOUR KIDS!